AFC Telford United have signed attacking midfielder Karl Ledsham on a month's loan from Lincoln City. The 26-year-old first played for Bucks boss Liam Watson when he joined his former club Southport from Skelmersdale United four years ago. 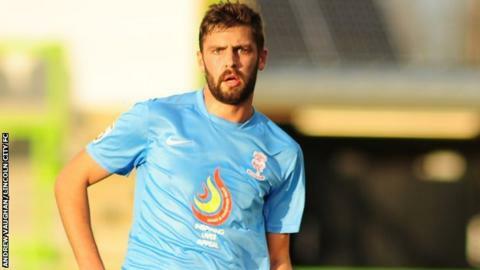 Having scored 24 goals in 140 league games for Southport, he moved on this summer to Lincoln on a one-year deal. But he has made just 13 appearances, scoring once, and has been left on the bench for the last two matches. Before joining Liam Watson at Southport, Karl Ledsham also played non-league football on Merseyside for Skelmersdale United and St Helens Town. The Liverpudlian did feature, however, in Lincoln's 2-0 win over Telford at Sincil Bank last month. The Imps stand 14th in the Conference table, 10 places and 11 points above bottom club Telford. Ledsham is the 18th ex-Southport player brought in by Watson since he left Haig Avenue to take charge of Telford 18 months ago. Meanwhile, Bucks captain Sean Clancy could be out until the New Year after breaking his collarbone in a 2-1 win for the Conference's bottom club over Altrincham on Wednesday.